You are about to read a transcript from several private conversations we have had with Mary Magdalen over the last several years. These “talks” dealt with a wide range of topics and we personally found Magdalen’s comments deeply insightful, which is why we are sharing them. M, as I call her, is a master of one-liners—short pithy statements that leave one reeling. One of these in particular caught my eye, perhaps because it addressed a strange paradox. The word transformation has two roots—the word “form,” meaning the structure of something and the Latin word or prefix “trans,” meaning beyond, across or on opposite sides. Thus the word transformation means something akin to moving beyond form. Our entire world is in a process of transformation. In truth, it always has been. But for whatever reasons—some say time acceleration—the rate of transformation has sped up. The Industrial Age has given way to the Age of Information and Nano-technology with a speed and a force that has left the Western world reeling. Whole industries and ways of life have disappeared in the blink of an eye. New technologies enter our lives at an ever faster pace creating what the Chinese language denotes when it uses the word transformation—a combination of two ideograms meaning danger and opportunity. There is opportunity whenever transformation occurs. This is because new territory is opened and stepping beyond our habitual view of things can usher in new ways of perceiving as well as new ways of acting in the world. But there is also danger. The danger arises out of the unavoidable fact that we may not fully understand the new territory we are entering and we might do something that we will later regret. This applies to all types of transformation, by the way. But since I was talking about the Age of Information and Nano-technology, let me pull up one simple yet poignant example. The introduction of pesticides into agriculture heralded a new era, as did the development of petrochemicals to produce things like plastic and the ever-growing array of techno devices that our modern way of life in the west depends upon. This has been, and continues to be, a major source of global transformation. But there has been a price tag—the contamination of our ecosystem through toxic chemicals and agents that have never existed in the biosphere before. Back in the early 1960’s Rachel Carson sensed the unseen dangers of this type of transformation—namely the introduction of chemical agents and pesticides into the environment. Armed with solid and credible documentation, she released her book Silent Spring in 1962, which many credit with giving birth to the environmental movement. As I write these words, some fifty-one years later, our environment continues to be negatively affected by technological advances. How we choose to manage—or fail to manage—the pace and type of technological development that we release into the world will determine, to a great extent, our future upon this planet. But there is another element at play here, what the futurist Alvin Toffler called Future Shock. The idea is that we are not biologically or evolutionarily equipped to deal with the speed of transformation that we are a part of. As a result of too much happening too fast, more and more of us are succumbing to a mental state akin to shock. The Hopi have a word for the state of the world we live in, and they call it Koyannisqatsi—meaning life out of balance. From the Indigenous perspective, the underlying source of our collective post-modern malaise is quite simply a disconnection from the Earth itself. And it is only through a reconnection with the Earth and our ecosystem that we can return to sanity. I often say that it is a highly creative and courageous act to find balance in a culture that is essentially dysfunctional. And yet balance is crucial to the spiritual journey for without it we cannot find our way through the maze of Maya (the illusions of this world), or increasingly through what I call Techno-Maya—a 21st Century version of illusion generated through technologically generated mass hypnosis that makes it easier to control the masses. All of this brings me to an essential question for those of us striving to live upward in consciousness. How do we deal with the hopelessness and despair that arises when many of us on the spiritual path contemplate the collapsing of our ecosystem and witness the increasing madness of our world not to mention the technological manipulation of information? Magdalen was addressing the process of personal transformation when she gave that little tidbit about true transformation not requiring hope and moving even in despair. But her observation most certainly applies to our collective quandary as well. The journey of an Initiate requires a different attitude toward the world and its challenges than that of most people. For me, you are an Initiate if you are striving to live upward in consciousness regardless of the spiritual tradition or path you have chosen. And a central question for any Initiate (i.e., you) living in the midst of such Koyannisqatsi is how do you persevere? How do you live upward when so much of the world seems to be spiraling downward out of control? Each of us must answer these questions for ourselves, and our very lives—at least our spiritual lives (meaning our higher consciousness) depend on how we answer those difficult and thorny questions. Since I was asked to write an Introduction to this section of the book, I will offer my opinion. But do understand that my view is constantly changing, and my opinion next year might be different than what I hold to be true now. We are spiritual beings having a human experience—not just human primates, with “monkey-minds” having spiritual experiences. There is a difference between these two perspectives, and they are not just semantic. By the term “spiritual” I simply mean some aspect of consciousness that is transcendent to time, place and circumstance. Looking at what is happening in the world today, I would say that humanity has failed in this task. But then again, we are not solely to blame for this. Much of the responsibility for our avoidance of this difficult and dark territory falls squarely upon the shoulders of religion as well as many of our spiritual traditions including most definitely the New Age. This leads me inexorably back to Magdalen and her unique perspective. This being does not shy away from dark un-owned material. She un-earths it and brings it to the light of conscious awareness. And she does this with an eloquent directness that I personally find refreshing. You and me—as well as the entire world—are caught up in a global maelstrom. We are witnessing the death throes of an old world and the birthing of a new one, but only time will tell if this new world will be worth living in or not. This uncertainty leaves us in a precarious emotional position. Finding our way through the carnage of our civilization as it morphs into something new is not easy. And along the way, many of us might dip into the shadow side of hopelessness and despair when we look at the world around us. The paradox within her statement is that true (meaning authentic) transformation moves (or unfolds) even in despair. How could this be true? Isn’t despairing the end point of hopelessness? Yes and no, in my opinion. If despair is indulged in without any other counterforce in the psyche, then yes it can easily be the end point. But if we (meaning you and me) can find a way to experience our transcendent Selves—or at the very least our more resourceful natures—then we will neither be bound by, or defined by time, place and circumstance. For some of us, this kind of freedom will be generated through the art of transcendence via some type of spiritual tradition. Some of us will discover it through new forms of creative insight and expression having little to do with what others might deem to be “spiritual” at all. But in my opinion, it isn’t so important how we attain a renewed sense of ourselves so long as we attain it. Without the type of renewal that arises from the inner well of authentic spirituality and/or from deep and profound creative insight, I think we will be left ill equipped to cope with—much less transform—the chaos that has engulfed the world. But let us take another last look at M’s enigmatic comment about transformation and despair. As each of us lives the transformational process that is our own lives, it inevitably intersects with the larger transformation that the world is going through. And because we are collectively paying the price for un-owned shadows, we may from time-to-time fall prey to the shadowy feelings of hopelessness and despair. Should this occur for you, as it has for me, I think it might be best to view these difficult emotions as a call to presence rather than a sign of failure. Hopelessness and despair can certainly be, though not necessarily, a sign that it is all over. And much like the call of the Sirens out of ancient Greek mythology that enticed sailors to their end, we can easily be seduced if we are vulnerable to such feelings. After all, anyone who has truly entered the dark seas of hopelessness and despair knows that these feelings can have a strange seductive quality about them. But just because something arises within us, or around us, does not mean that we have to accept it. My advice is to transcend those shadowy moments, should they arise, through potent spiritual insight and/or through bold creativity—meaning the act of doing something radically different than what you are used to. What that action might be is up to you. True spiritual insight and profound creativity can change all that the mind perceives including the darkest and most difficult to redeem of human emotions—despair. 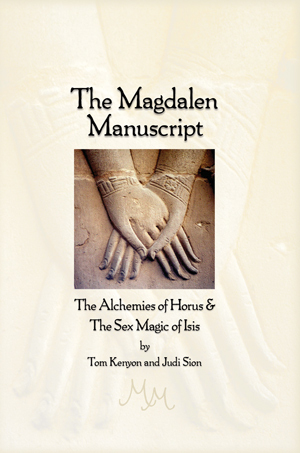 At her request, we have adopted the spelling of her name without an “e” at the end in order to denote that this Magdalen is an interdimensional being, and her life as Mary Magdalene was only one expression of her larger identity. Another reason she asked us to spell her name without an “e” at the end was to differentiate the being we communicate from other sources of channeled material. We did spell her name in the main menu tab using the traditional spelling in order to facilitate recognition by Internet search engines. Please note that this, never before published material, is for your personal use only. It is copyrighted and no portion may be printed, copied, posted on the Internet or distributed in any media, physical and/or electronic without the authors’ written consent.